Millions of Nigerians both home and abroad looks up to Nigerian Newspapers and Online News Portals everyday in search of the latest news about the state of the nation. Expecting these papers to deliver news that is factual and devoid of biased reporting. We expects high level of investigative journalism that expose public and private scandals. While few are performing very well in their duty of providing responsible journalism, majority are simply not doing well enough. Most of these newspapers have been bough over by corrupt governments in power while some are outright establishments of corrupt officials in past and present governments in Nigeria. It is so sad to note that many atrocities happens in Nigeria without being reported, not because the newspapers are not aware of it but because they have been bought over or are being intimidated not to say a thing. Using terms such as “preserving our nascent democracy” “avoid heating up the polity” and other stupid expressions to suppress news is what Nigerian government is well known for, which has contributed to the inefficiency of the Nigerian newspapers and other media. Do you know all the Nigerian Newspapers and their website? Here you have it – the comprehensive list of major Nigerian Newspapers and their Online news websites and how we rate them. Blueprint Newspaper – Blueprint is a regional daily newspaper in Nigeria published in Abuja and distributed in and around the federal capital territory. There is no much to be said about this newspaper since they where just founded in 2011. But mimicking MSN website design shows high level of imitation and follow follow they may probably be. Business Day – This newspaper is published by former Vanguard editor Frank Aigbogun. It is circulated throughout Nigeria and Ghana and is known by many as the first business only newspaper in Nigeria. Great news website, rich with business data and resources! Business Hallmark – This is a Nigerian business newspaper that debuted in march 1009. It is published by Prince Emeka Obasi and has it’s website on BizHallmark.com. We currently have no positive nor negative comment about this newspaper but below is what I was the last time I tried to visit the site. This is an error 509 message indicating that the website is on share host with very limited resources. And for a news website to be on a shared host is evidence of non readiness in business. Mediocre at it’s best! Compass – The Compass is widely circulated in Nigeria, especially the western region where the owner comes from. It is owned by Gbenga Daniel, Governor of Ogun State from May 2003 to May 2011. In June 2009 the newspaper named Daniel the most outstanding governor in education in the country. The award to the paper’s owner publisher drew both criticism and ridicule. I was hit with database misconfiguration when I attempted to open the site on September 15th 2013. When it finally opened, what I saw was a less than average newspaper website that summed everything up – poor! Daily Champion – This Newspaper is owned and published by a politician from Imo State Chief Emmanuel Iwuanyanwu. His company constructed the only major road that leads to my village. A road that destroys brand new vehicle tires within weeks. Unarguably the worst poorly constructed load the world has ever seen. Champion newspaper is based in Lagos but has become the major newspaper for people of the eastern region of the country. It’s website is one of the poorest news website I’ve ever seen with what could pass as the worst SEO in history of the internet. Daily Times – The Daily Times is one of the oldest newspaper in Nigeria and was once the most successful business in Africa of Africa origin. There was a time this paper reached over 400,000 daily circulation in Nigeria and probably the finest news media ever come out of Nigeria. However, all that have since been lost due to Government taking over and mismanaging the company in the mid 1970s. The newspaper website is on DailyTimes.com.ng and is currenly owned by Fidelis Anosike‘s Folio Communications. Daily Trust – This newspaper dominates in the north where it controls 40% of the market sharing, placing them among the top 10 newspapers in Nigeria in terms of adverts revenue. Daily Trust is headed by Kabiru Abdullahi Yusuf, a former senor lecturer with The Usman Dan Fodio University, Sokoto and former columnist with the BBC Africa. Daily Times is probably the only Nigerian Newspaper that is leveraging it’s brand equity on the internet by having it’s exact name on a top level domain name – DailyTrust.com. Unlike others that goes with names such as brabrabraOnlineNew.com, brabrabraNG.com, etc. However, they still get it wrong by having the .com redirect to .info instead of the other way round. Daily Post – This is one Nigerian online newspaper that is making waving, clearly proving that the future of Nigerian Journalism is on the internet. Have one of the best organized news website in Nigeria and is really going strong. Guardian Newspaper – Guardian was founded in 1983 by Alex Ibru and Stanley Macebuh. 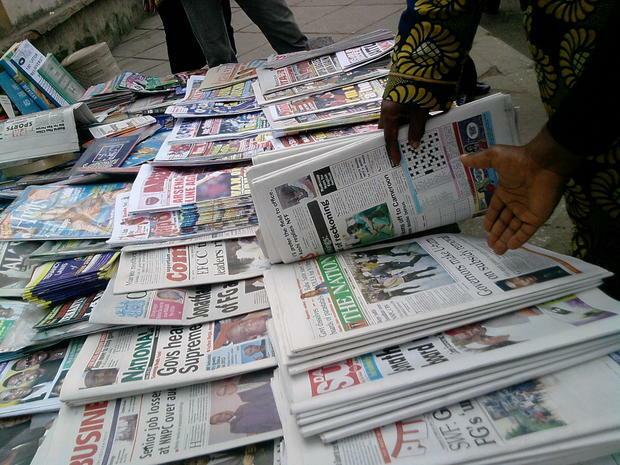 It is one of the most respected newspaper in Nigeria and has one of the widest circulation across the country. The Internet version is on NGRGuardianNews.com – a terrible domain name and badly put together news website. Independent – The Daily Independence is owned by former governor of Delta State James Ibori who is now in UK prison for convicted fraud and money laundry. It was formerly known as Diet Newspaper before it was relaunched in 1999 but has failed to live up to anything. Last time I visited the site, it was showing a mobile theme that looked funny. Leadership – In December 2009, the Nigerian Union of Journalists named Leadership “Newspaper of the Year”. On July 17, 2013, the Leadership reprinted the writer Shai Afsai’s photographs and first-person article “Igbo Jews of Nigeria Strive to Study and Practice” under the title “Igbo-Jews Of Nigeria Study And Practise Judaism,” citing the Leadership’s Igho Oyoyo as its author. After being threatened with legal action by the New English Review’s editor, the Leadership issued an apology for the plagiarism and a corrected byline, ten days later. LOL… We'll keep trying our best. Thank you! Daily Independent has re-branded to Independent Newspapers and is published by Independent Newspapers Limited. The website has now moved to another domain and the desktop and mobile version is great. You can check it out.